To increase insight to the world through teaching, coaching and counseling while displaying evident outcomes. To teach principles that lead to healing, growth, motivation & development. Tyra’s education, work and life experiences supports her in providing insightful coaching, counseling and spiritual educational services to individuals, couples, groups, businesses and leaders in sectors such as: public schools, college workshops, community centers, churches, businesses, state health centers, state prisons and psychiatric hospitals. She also work with businesses to develop creative ideas for marketing and clinical care. 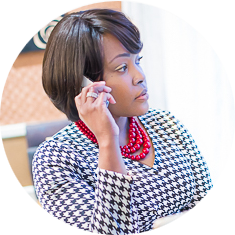 Tyra tailors her coaching, counseling and spiritual educational approach to meet people where they are to help them towards their best self and life paths. She developed and directed her own therapeutic firm and created policies and procedures that became nationally accredited. She gained effective leadership qualities by running businesses and teaching other business leaders; this gave her insight on the life of a leader. Tyra has worked with many different populations which include various cultures, ethnic groups and economical statuses throughout the United States of America. Tyra continues to work towards fulfilling her mission of increasing insight in the world, while producing evident outcomes that display a positive result. Bachelor Degree of Science in Literature/Psychology/ Elective Studies and Dance at Alverno Catholic College, located in Milwaukee, Wisconsin. Master Degree of Science in Professional Counseling and Community Counseling at Concordia Lutheran University, located in Mequon, Wisconsin.